We congratulate you on your decision to invest in your future by building your own business. If you have the commitment, desire and financial qualifications then you owe it yourself to investigate the Paradise Donuts opportunity. We realize that decisions of this magnitude are not made on the strength of expensive brochures or elaborate presentations but rather on informed and educated information. Paradise Donuts is attractive to the investor because it offers a great opportunity to people with various levels of capital and experience. If you are like many of our operators, you may have little or no experience in the food industry or in running your own business. Paradise Donuts has a proven system for success as well as the technical resources to help you stay ahead of the competition. Our organization consists of committed individuals dedicated to supporting your store. When you become part of the Paradise Donuts Family you acquire almost 40 years of experience and time tested results. A new business usually requires a considerable expenditure of its own time and money in trial and error. The proven Paradise formula eliminates many of the start up problems. Paradise Donuts customers know our name and recognize our distinctive appearance. Our store design, with its use of bright eye catching signage, is immediately noticeable in either urban or suburban locations. In addition to being highly visible, Paradise Donuts bright and attractive colors are always inviting to your customers. The over all appearance of a Paradise Donut shop has been proven over our nearly 40 years of history, making your entire store an effective sales center. The most distinctive feature or quality of a Paradise Donut shop is the quality of product and service that each store creates. Paradise Donut operators come from all walks of life bur seem to share one common goal, to achieve the �American Dream� of independence through self employment. As an operator you will enjoy continuous savings on equipment and supplies because of Paradise Donut Inc.�s ability to negotiate volume purchases spread out over a base of multiple stores. This on going process is part of our goal to keep your business at the most profitable level possible. Most people know that a small independent business owner can not afford to buy and inventory large quantities of goods or undertake extensive advertising programs. This is the reason the buying power that is available to a Paradise Donut licensee is so attractive. 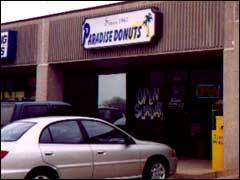 At Paradise Donuts we pass the savings on to our stores, Furthermore as the amount of the Paradise stores increase, so does the public awareness of the brand name. This is a tremendous advertising advantage to you. Whether you choose to own a single store or multiple outlets, Paradise Donuts is dedicated to offering top quality supplies, equipment and technical assistance in order to enable you in reaching the highest level of success. We at Paradise Donuts ask you to remember that when you put your time and energy into your work, you deserve more than just a salary, you should have the opportunity to grow and profit from your gained expertise. It is the owners of business� that are in a position to be in charge. And there by reach their goals. Paradise Donuts offers you the opportunity to reach our one common goal, to achieve the American dream of being independent through self-employment. If you have the commitment, desire and financial qualifications then you owe it to yourself to investigate the Paradise Donuts opportunity; self- employment, expansion or diversification. We will do everything possible to help you achieve your goals with honest answers to your questions. Contact us Today Click Here!